West Virginia's Vital Registration Office maintains Wyoming County birth, death, and marriage records from the years 1917 on. Only family members can obtain non-public records, birth records less than 100 years old and death and marriage records less than 50 years old. For vital records before 1917 and all divorce records, see the Wyoming County Clerk. 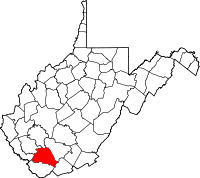 Wyoming County was created in 1850 from Logan County, Virginia. Raleigh and McDowell Counties were formed from its territory. In 1799, John Cook, Sr., moved to modern Wyoming County with his family. The 1890 census shows that a majority of the county's residents were his direct descendants.